331 W 51st Street between 8th and 9th Aves In Hell’s Kitchen. 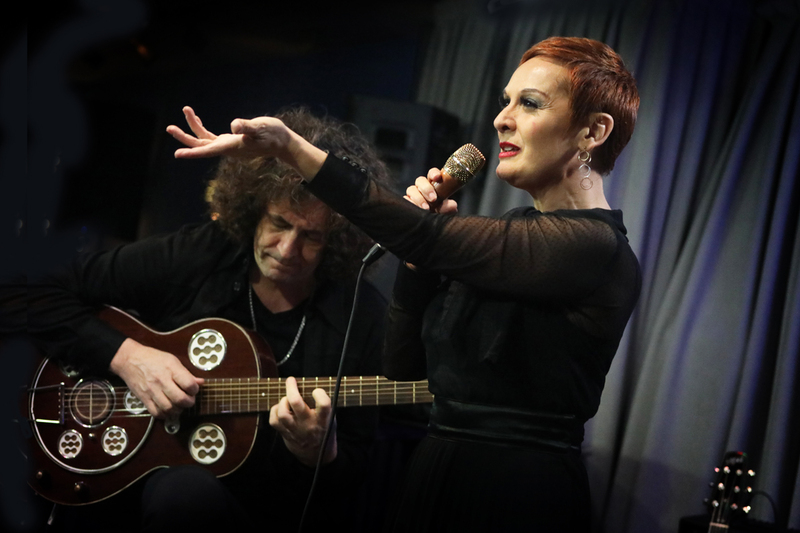 Singer Mafalda Minnozzi and guitarist Paul Ricci have broken musical ground in Brazil and Italy in a long running collaboration resulting in Mafalda’s notable solo career. Over time the freedom of their musical empathy overshadowed the usual larger band format resulting in a duo with its own unique language derived from both their Jazz and European upbringings and their extensive touring. Collectively they have recorded or performed with Milton Nascimento, Leny Andrade, Astrud Gilberto, Harold Vick, Sonny Fortune, Manolo Badrena, Guinga, Bebel Gilberto, Toquinho, Hugo Fattoruso, Bobby Sanabria, Dom Um Romao, André Mehmari, Roy Haynes, Harry Belafonte, Mike Clark and so many others. Mafalda’s style is defined by her charismatic stage presence, vocal range and versatile timbral palette that blurs the line between singer and improviser earning her a prestigious “Targa Tenco” nomination by the Italian press. The result is a truly unique experience that leaves audiences both surprised and emotionally moved. On their return to Birdland they will be joined by special guest Rogerio Boccato on percussion. – Gerlando Gatto: Italian Jazz author at “A PROPOSITO DI JAZZ”. 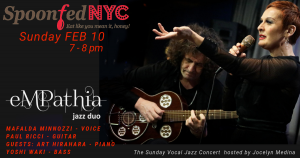 “… the eMPathia Jazz Duo delivered the hottest show of the night… the Italian singer Mafalda Minnozzi and American guitarist Paul Ricci literally raised the audience with jazzy versions of ” A Felicidade, “Desafinado” as well as other classics such as “Every Time We Say Goodbye” and “Estate”. – Carlos Calado: Brazilian Jazz author and critic at “FOLHA de S.PAULO”. – Alberto Bazzurro: Italian Jazz Critic and author at “MUSICA JAZZ”. – Humphrey Inzillo: Argentine Jazz critic and author at “LA NACION”. – Stefano Dentice: Italian Jazz Critic at “ITALIAINJAZZ”Info.